Please check http://www.911blogger.com/node/17419#comment-196200 for original posting by USAPatriot with active links. They have worked for almost seven years in secret. Most people did not know that the work in Ray Goehner's materials characterization department at Sandia National Laboratories was contributing important information to the FBI's investigation of letters containing bacillus anthracis, the spores that cause the disease anthrax. The spores were mailed in the fall of 2001 to several news media offices and to two U.S. senators. Five people were killed. Sandia's work demonstrated to the FBI that the form of bacillus anthracis contained in those letters was not a weaponized form, a form of the bacteria prepared to disperse more readily. The possibility of a weaponized form was of great concern to investigators, says Joseph Michael, the principal investigator for the project. This information was crucial in ruling out state-sponsored terrorism. 9/11 Truth, Part 4 of 11- What Did They Know & When Did They Know It- and What Were They Doing? This article reviews some of US administration’s and defense, intelligence & law enforcement agencies actions in the years and months before 9/11. The public record of government reports and statements so far makes clear that there were many, many warning signs that Al Qaeda was plotting attacks, and that policy makers in these administrations and agencies were aware of this; why didn’t they stop the attacks? The FBI has now after only 7 years and and 2 wars declared the Anthrax case solved. "See that dead scientist? Yea, he's the guy that did it. All by himself. Too bad he's dead huh?" This just caps off what could be one of the most disastrous criminal investigations in U.S. History. And that says a lot when you include 9/11. And you should as they are related, and on some level I think nearly everyone knows this. The evidence the FBI says it has and that we will go through, they admit is all circumstantial but they said they have won cases just on circumstantial evidence alone, which I don't doubt, but they would not have run on this case. Very convenient, and extremely creepy that he wound up dead and did them such a tremendous favor. after taking an overdose of acetaminophen, you may have no symptoms from taking a toxic amount. You may remain symptom free for up to 24 hours after taking a toxic overdose of acetaminophen. The main focus in the 9/11 Timeline this last week has been the anthrax attacks. There was some material about them in the Timeline at one point, but it got lost somehow. It has now been revived and new material has been added. 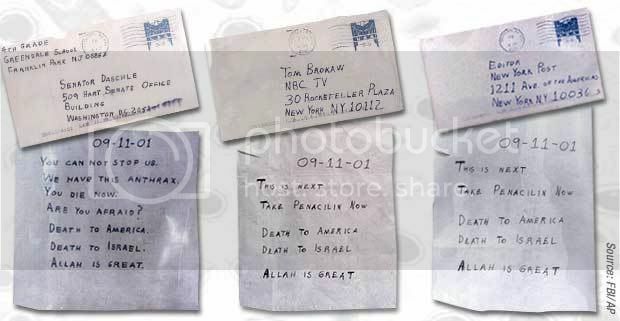 The first anthrax mailing was in 1997, when the target was the Jewish service organization B'nai B'rith, and the CIA investigated the possibility of anthrax attacks using letters in 1999. Wrongly accused scientist Steven Hatfill's contract with USAMRID ended in the same year, and he then started helping the US military build a mock biological weapons factory. White House staff started taking anti-anthrax drugs on 9/11. Sen. Charles Grassley and Rep. Rush Holt want hearings into the Justice Department and FBI's handling of the case. WASHINGTON -- After seven long years, the FBI and the Justice Department say they are closing the books on the anthrax investigation. But the investigation into the investigation is only beginning, and it will focus on what Congress members described Thursday as apparent missteps by authorities that dramatically prolonged the probe, unfairly maligned an innocent government scientist, and raised questions about whether federal agents had conclusively ruled out other suspects besides microbiologist Bruce E. Ivins. Sen. Charles E. Grassley (R-Iowa) and Rep. Rush D. Holt (D-N.J.), frequent critics of the FBI, demanded a far more detailed release of documents by the bureau and the Justice Department to support the government's case, as well as congressional hearings into the investigation. WASHINGTON - In the immediate aftermath of the 2001 anthrax attacks, White House officials repeatedly pressed FBI Director Robert Mueller to prove it was a second-wave assault by Al Qaeda, but investigators ruled that out, the Daily News has learned. After the Oct. 5, 2001, death from anthrax exposure of Sun photo editor Robert Stevens , Mueller was "beaten up" during President Bush's morning intelligence briefings for not producing proof the killer spores were the handiwork of terrorist mastermind Osama Bin Laden, according to a former aide. "They really wanted to blame somebody in the Middle East ," the retired senior FBI official told The News. First off, the CIA were tracking the hijackers and knew they were mujihadeen and associated with so called terrorists. They deliberately let them into the U.S.
"U.S. intelligence officials said that in January of 2000, when Almidhar and Alhazmi attended a meeting of known terrorists in Kuala Lumpur, Malaysia, that fact was communicated by the CIA to the FBI." So the high ups in the FBI were told of these guys already, but the FBI wants to play dumb. Soon they will just flat out show corruption. "October 9, 2001: FBI Agents Told to Curtail 9/11 Investigation and Focus on Preventing Future Attacks"
What else happened on October 9? What prompted this outrageous "stand down" order across the FBI? Maria Ressa of CNN reports that 9/11 paymaster Mustafa Ahmad is an alias for a "Sheikh Syed", a 28-year old Pakistani former student at the London School of Economics who was released from an Indian prison in 1999 after being bartered for hostages taken in an airline hijacking that was "strikingly similar to the four hijackings carried out on September 11." Ressa also links "Syed" (hereafter known as Omar Saeed) to the October 1 attack on the Kashmiri legislature. The invasion of Afghanistan begins. Pakistani ISI General Mahmud Ahmad (not to be confused with the 9/11 paymaster alias "Mustafa Ahmad") is suddenly dismissed by Pakistani President Musharraf. 1st 4 paragraphs, lots and lots of html links- who sent the letter to Quantico before the attacks, trying to pin them in advance on Assaad? Why didn't the FBI investigate the letter sender, who it appears had foreknowledge? Instead, they cleared Assaad and tried to frame Hatfill. You remember the anthrax attacks – or do you? It often seems, to me at least, that this important catalyst for the invasion of Iraq and our supremely wrong-headed post-9/11 foreign policy has been flushed down the collective memory hole. For all the attention that's been paid to that spooky chapter in the history of the "war on terrorism" in the intervening years, it may as well have never occurred. That's why news of the former prime suspect's ultimate vindication – and his victory in a $5.8 million lawsuit in which he accused the feds of unfairly targeting him as a "person of interest" (as John Ashcroft put it) – seems like a visitation from another time, the ghost of 9/11 past, haunting and mocking us. It sends chills down my spine – because, you see, the real culprits are still out there.